Here’s a movie which has been on my radar for a long time, and which I’m embarrassed to say I hadn’t seen. It certainly is well qualified to be on my march to 200 reviews (unlike that last piece of crap I reviewed, which was unfortunate) and I’m happy I finally got to it. There will be some light SPOILERS AFTER THE JUMP, but know that this gets a big recommend from me. This film has so much going for it. Winner of 7 Oscars, including Best Picture, it is a film which uses non-diagetic audience assumptions to make the tension greater. 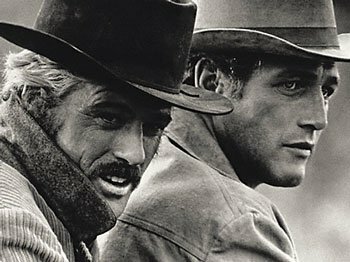 See Newman and Redford had been Butch and Sundance just a few years earlier. They bring with them that baggage, and the thought that those two might not go down shooting together permeates throughout this film. The concept of one betraying the other is crazy, and it adds to the tension. The other actors are superb. Liz and I paused this thing six or seven times trying to figure out where we knew this actor or that from. Many are character actors, and all are pitch-perfect in THE STING. 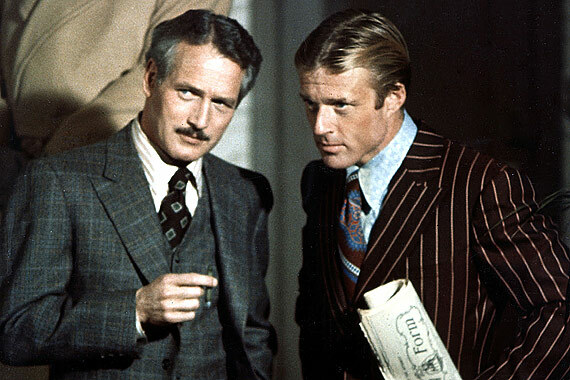 The film follows a team, led by Newman and Redford, running a big scam on a big time crook. The team building is not the focus, something which cripples other films of this sort, but which works here. We get to know the bit players a little, but none of these sidekicks are the gallery of stars that populates, say, the OCEAN’S 11 films. Because of that, we get much more in depth with Newman and Redford, and we care much more (and have bigger doubts) about the outcome. There’s a single moment of violence in this film that is shocking in its suddenness. Rated PG in its day, that shot alone would give this an R Rating today. None of that matters, but the audacity and quickness of that moment is what makes it work so well. It elevates the danger at a key time, and it tightens the conclusion of the film so much. Liz and I also discussed throughout the theories we had. We were pretty close and we wrote a pretty good movie in the process, but the ending here is right in tone, and even if it would seem simple in today’s filmic world of triple and quadruple-crosses, it works. This is the sort of film that could have been 20 hours long and I would smile and watch the whole time. The charisma, the chemistry, and the enjoyability are all there. But so is the attention to the filmmaking. This picture takes place in the 30s, and the film allows itself subtle (and not so subtle) homages to that era. There is a Chaplin-style chase (which Liz caught… I’m proud of my filmicly intelligent wife), we get open iris and close iris shots, we get silent-era title cards, and we get some great, great ragtime music. I put this into my classics list instantly. I know I’m late on that boat, but I’m glad to be on it. So happy I finally saw this. It made me really wish that TCM had an HD version of its channel. I want to hunt down a Blu-Ray and watch the beauty of this world in HD so, so bad. The bonus is for the ragtime piano music (I loved that the pianist is credited in the end with ‘Piano Rags By Scott Joplin’). It creates an absolute heartbeat for the film, and just as important are the moments when NO score is utilized. Great musical choices throughout. ~ by johnlink00 on October 22, 2010.